In this harmonic mixing showdown, Dubspot’s Mike Henderson (aka Endo) compares the key detection capabilities of Mixed In Key, Traktor 2.6.1, Rekordbox, Rapid Evolution, KeyFinder, Beatport, and djay. With the evolution of digital DJ technology, more and more people are able to perform with their music collections, and remix their own songs live. No matter how we old-school DJs feel about it, current technology can beat match songs and even detect their key, making it easy to quickly find songs that sound amazing when played together. Key mixing, or harmonic mixing, is an advanced DJ technique that involves playing tracks that are in the same key (or complimenting keys), or deliberately modulating keys to control the energy of the room. One program that really revolutionized DJing for me is Mixed In Key. It analyzes your digital music files, detects the musical key of each one, and writes the key information into the file’s metadata, so you can see the key in programs like iTunes, Traktor, and Serato Scratch Live. This allows DJs to sort their playlists by key, and quickly find tracks that harmonize with each other. Mixed In Key uses Camelot wheel notation to represent the keys. Before Mixed In Key, I would key every song manually using a piano, write the key on all of my records, and sort my record crates by key. I still do this for each track, but I use Mixed in Key to guess the key first to save time. Since Mixed In Key was introduced, other key detection programs have been released, and now digital DJing programs are building in key detection as well. Recently, Native Instruments has added key detection to Traktor Pro 2.6.1 and Traktor DJ (their iPad app). Their system, based on Open Key Notation, automatically displays the key of each song and even color codes the keys so you get a better visual representation of what songs go together. Algoriddim’s djay has added key detection as well, and Pioneer has gotten in on the game with rekordbox, which makes it possible to sort playlists by key in conjunction with the new generation of Pioneer CDJs. There are also free key detection programs, such as KeyFinder and Rapid Evolution. Industry-leading dance music store Beatport now automatically writes the key of each track into the songs you buy. So, with all of these options, the big question is which program has the best key detection algorithm? 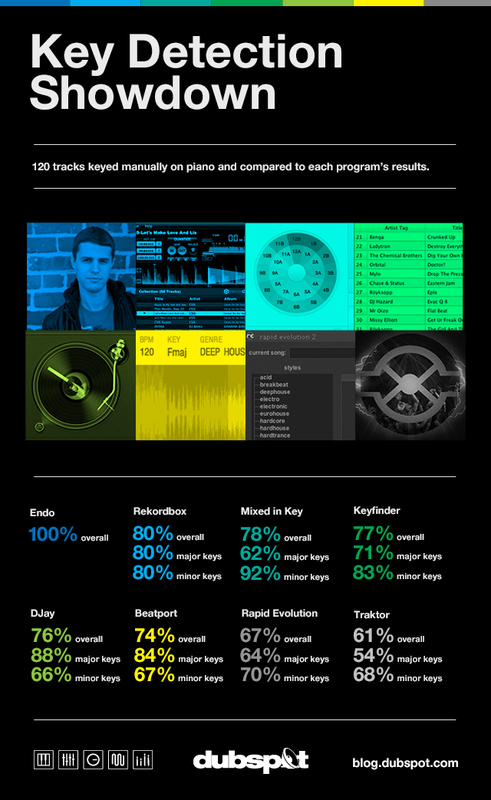 In this study, I have compared Mixed In Key, Traktor, Beatport, rekordbox, KeyFinder, Rapid Evolution, and djay. I used 120 tracks that I keyed manually on the piano, and compared my results to each program’s results. I can assure you I’ve triple checked each song, but I have provided Beatport links and YouTube links in case you want to challenge any of my results. I picked about five tracks from each key. Please don’t judge me on my tracks in major keys–these tracks are rare in dance music, and over 99% of my collection is in minor keys! On the chart, the incorrect results are colored red. The results are interesting. You can see that each program has its own key detection algorithm, since the results are different in each program. Some programs are very good at picking out major keys, while others are better at detecting minor keys. While rekordbox might have the best “overall” accuracy, I still choose Mixed In Key over every other program, because most of my music collection is in minor keys. For me, this makes it a clear winner. Keyfinder is a nice free alternative, and does a great job, although the interface isn’t quite as pretty as Mixed In Key. For CDJ users, rekordbox does a great job of detecting keys, so that may save you the step of using an additional program. It’s really disappointing that Beatport still has such a poor key detection algorithm. I typically report incorrect keys to Beatport, to help with their algorithm–hopefully more users will do the same and their key detection will improve. (You can also check out my previous Beatport key detection lab report). Algoriddim’s djay was far more accurate than I thought it would be. (This program is a lot of fun to play with–see my full review). Rapid Evolution didn’t do nearly as well as the other programs, but I commend them for their hard work. The shocker in this study was how inaccurate Traktor and Traktor DJ are. When I began this study, Traktor appeared to be nearly 98% accurate. I realized, however, the high accuracy was due to the fact that my tracks were locked, so the keys weren’t changing. When I unlocked the tracks and reanalyzed them, I got the real–very bad–results. Fortunately, the Traktor developers are hard at work on this. Given that this is only the first generation of Traktor’s key detection, I’m sure it will improve over time. If you want to learn more about harmonic mixing, check out my tutorial on harmonic mixing. I hope you enjoyed the article! For more articles and videos, stay tuned to dubspot.com. For more info about me, check out www.djendo.com. Also, to learn more about harmonic mixing, be sure to check out our online Digital DJing with Traktor course with myself and DJ Shiftee. Happy mixing! The next Dubspot Podcast will be a brand new harmonic DJ mix by Endo. Please stay tuned for that! DJs who mix harmonically: Sasha, Pete Tong, Dubfire, Sharam, David Morales, DJ Skribble, Felix Da Housecat, Armin Van Buuren, DJ Shadow, Z-Trip, Paul Okenfold, Tiesto, and more.